Before I launch into this post I have to give a warning. There will be a rather down-to-earth talk on answering the call of nature for women at the end of this post. I will give warning at the start of the section so if any of my dear readers wish, they may depart before any delicate sensibilities are offended. 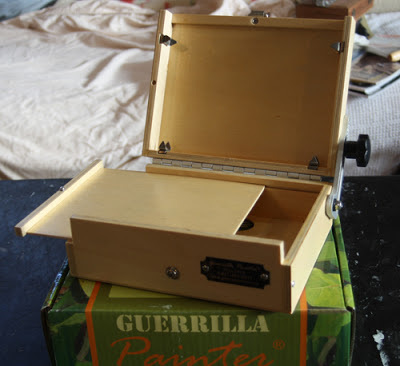 Yesterday my new Guerrilla Painter pochade box for plein air painting arrived. I am so excited! The set up I have been using is extremely heavy. My pack ends up weighing about 25 pounds by the time I get it loaded up. Even if I drive down to Neahkahnie Beach (about a mile) I still have a hike up the beach, not to mention wading through drainage streams and occasionally incoming waves. I decided to order something lighter and easier to pack. I have made the decision to get out to the beach to paint as often as I can with the goal being everyday. Yes, you read that right, everyday! Now, knowing how life happens I might have to miss a day or two but I am still going to see how long I can go. I have 77 - 6"x8" loose hemp canvases in the process of being gessoed. I am about half way through. I have to order more gesso to continue. I have enough to start painting though. I tape them to a 6"x8" support to paint on. I decided to do it this way for the first 75 paintings to keep them as studies. I will be using the resulting marine studies to paint larger paintings in the studio that will be for sale. I am so excited! I broke in the box today. We just recently had that huge storm and the beach is littered with a lot of branches and logs. The waves were also filled with huge trees and logs, which is very dangerous. I kept a sharp eye out for rogue or sneaker waves. They come in deceptively fast carrying those trees with them. Never turn your back on the ocean! I saw one tree that was over 60 feet in length. I hiked from my house to the north end of Neahkahnie beach and set my new rig up. I have a nice tripod that the box attaches to. I must say it went up fast and easy. The tripod is sturdy and didn't blow over even when I was hit with a sudden squall. The sky was partially cloudy with huge thunder clouds. All of a sudden the squall appeared on the horizon. I started painting as fast as I could before it hit. I was painting so fast that I produced the worst painting I have ever made! It hit with wind, rain, and hail. By the time I packed up it was gone. I could have just waited it out but I needed to get back home. The painting was bad and I didn't have as much time as I would have liked but, I did it. I took that first step! I will be going out tomorrow morning too before coming back to prepare my Thanksgiving feast. Just a quick note here, I am vegan. There will be no turkey but there will be tofu "crab" cakes, smoked tomato and wild rice soup, roasted cauliflower, assorted seasonal side dishes, and a raw pecan pie, washed down with a hard cherry cider and followed by coffee. Getting back to today's plein air jaunt, I do plan to post the paintings as often as they are made. I am not posting today's painting because it was so bad. My goal to to produce 100 small plein air marine paintings. I am clearing one of my bulletin boards to pin them all up on. Perhaps I will share the very first one when I reach 100. On the way back home I spotted this wooden float and brought it back with me. Here it is with my beautiful dog Twill. She had a good time sniffing it. I am looking forward to this exciting challenge that I have begun. I will be switching my oil paints that I use to Cobra water-mixable paints for ease of use out in the field. I will continue to use my oil paints in the studio. I am going to end this part of the post here and wish everyone in the U.S. and the rest of the world too a Happy Thanksgiving. 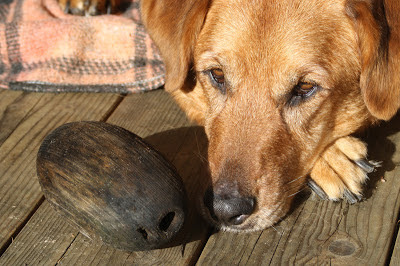 I give thanks for good health, loved ones, including the furry one above, and wonderful online friends and artists. 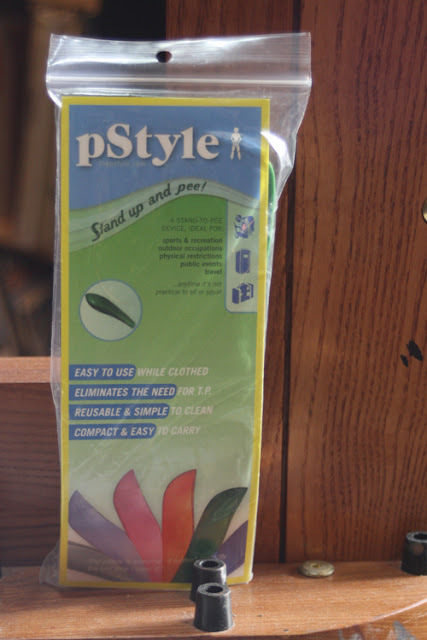 Note the "easy to use while clothed". I also like the colors. The freshette only comes in a gruesome pink so-called flesh tone. When you are a mile or two hike from the nearest restroom and in the middle of painting, it is best to be able to find a discreet way to take care of the call of nature. I say discreet because there are houses that overlook the ocean where I paint. I really don't want someone with a telescope or binoculars to get a view they may not have (hopefully!) intended. Now, I haven't had a chance to try it out yet but I will give a brief thumbs-up, or down in a future post when it has been tested. Readers who skipped this part won't know what I am talking about but you all will! If you have gotten this far, thanks for hanging in there. I am posting this info for those women like me who love the out-of-doors but would really like another way to take care of certain realities. I'm so far behind Renee, I don't know where to start. Okay, I'll start with riding. That looks like a very clever device for the call of nature! :) I'm lucky that it is likely when that happens I am in pretty remote areas, but a certain addition to the saddle pack. 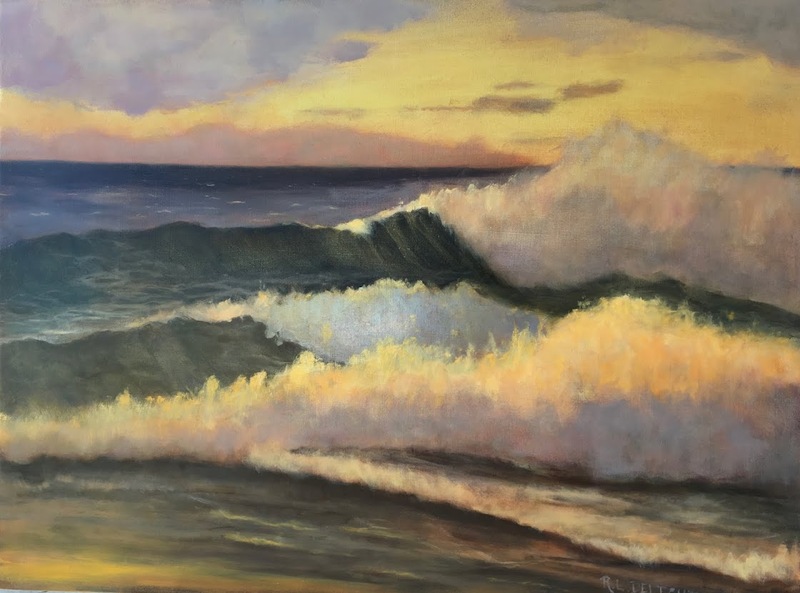 The little painting of the ocean in the past post (Wave Study 2) is lovely and I love it. Great job. I can feel the mist and spray from here and we both know I'm pretty darn land locked! Have a wonderful Thanksgiving Day. That little plein air painters box is a thing of wonder BTW. I don't know what in the world I would do with one but nothing is as seductive as an interesting treasure hideaway! Oh my, what a lovely pochade box!! Have a wonderful painting with it!! Thanks for you comments Polly and Theresa! Theresa, I know what you mean about seductively interesting treasure hideaways. I am not immune to them myself! The box is working out fine for painting outside. I didn't have time to post today's efforts but will do so tomorrow. My posts will be increasing but most will be shorter. Thanks for stopping by. Dog on the Loom... I mean Easel!